Anyone used a blender for on and off camera use? Anyone compare it to geling down a Sola 3? The Paglight 9965 looks interesting but not much written up about it. 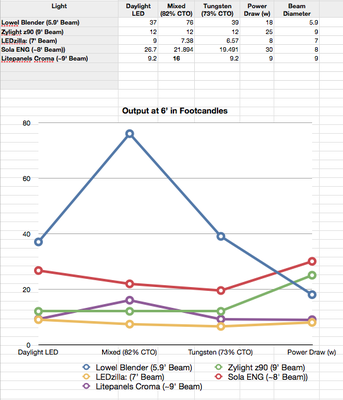 Re: Anyone compared a Lowel Blender LED vs Sola 3 or Paglight 9965? I used the blender and found that the dimming function really is by adjusting the brightness of the color leds. If you have adjusted the color to be fine at 3750K and you wish to dim or brighten it WITHOUT affecting that setting you may have to do a white balance everytime you decide to change the brightness, as there is no dedicated dimmer. It has a nice feature in that it can be powered from 7.2 volt DC camcorder li-ion batteries as well as the 14.4V p-tap connector, whereas the sola needs at least 10 volts and the pag from 12 volts. The sola and pag don't work with the 7.2 volt. The pag seems bright at 850 lux at 2 metres which really makes it like a whopping 3400 lux at 1 meter, BUT, was that figure taken at the NARROW beam ? most likely, and put the amber warming gel on that and see the luxes drop. The sola's variable beam is nice BUT then again, as most led units are measured WITHOUT the amber on. If you are mostly shooting daylight, the sola on narrow is a good fill as well as the pag. Take them indoor for wide flood coverage and balance for 3200K and the brightness may be marginal depending on distance. I wish the sola had provision to use 7.2 volts as I had to lug around a 14.4 volt brick for powering. The blender should have had a separate color and dimmer control, so once the color temperature is set, the dimmer would work independently. That was the only reason I did not buy it. The only reason I did not go for the sola is the 10 volt minimum. The sola is fine for ENG with P-tap off the camera. I did not have the opportunity to try the pag.I think there is a need for a high output, high CRI 3200K-4000K-5500K selectable, wide beam unit that accepts a wide DC input range that can accept either a rear mounted battery or the p-tap cable as well as being extremely rugged and weather sealed. I am still waiting. Thank you Arthur. I didn't realize but the approach of two sets of LEDs changes the brightness as you bring one set up or down. Did you notice any effects from the multiple light sources of the Blender LED array vs the traditional single light source? 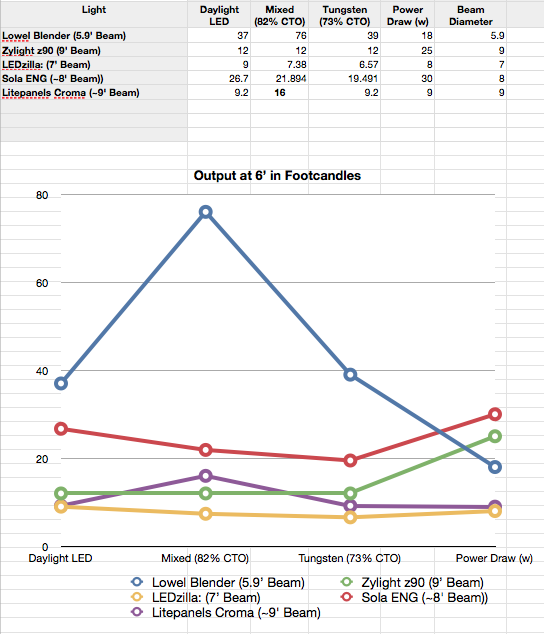 I see with the Blender that by definition, you only get half the total 76 footcandle output at 6 feet , 39fc at Tungsten and 37fc at Daylight. And there is no beam adjustment with it. According to Lowel, the Blender draws about 18w when both sets are on. 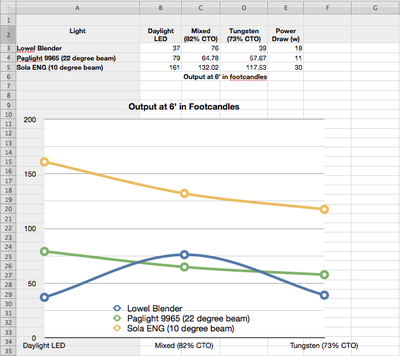 In contrast, the output of the Paglight at 22 degree beam, 6' and 11w draw is 78fc Daylight. Then the output drops as you get to Tungsten. Similarly, Sola ENG at 10 degree beam, 6' and 30w draw is 161fc daylight and drops. It's impossible to compare without full data but from just these numbers, the Sola has 2x the punch but is 3x the draw vs the Paglight. 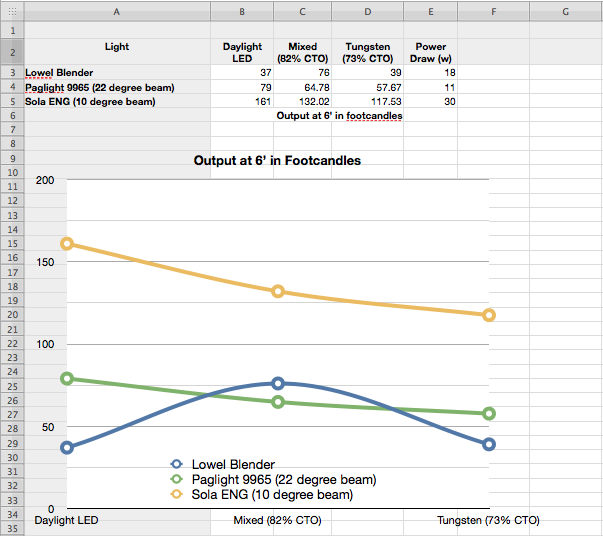 But assuming 83% transmission for 1/4 CTO and 73% for 1/2 CTO, the Blender develops a little more punch in the middle as the two sets of LEDs combine versus the Paglight which only gets dimmer. I don't have data for a 22 degree beam on the Sola but I plotted it out (attached) just to see relative to the others. The Sola and the Blender seem about the same size but the Sola is significantly lighter. I can't find the dimensions of the Paglight but it seems smaller. If anyone has data or experience with these lights, I'm interested in hearing it. and of course a photo of beam supplied. An EV chart calculator can be found here: Conversion Tables for LUX to EV and EV Exposure Tables for Infrared Photography. 999WED.com. this would easily enable one to find a relation between lux and f stop/shutter speed as well as the EV value of any given light brightness figure. Perhaps they should rate light brightness in an EV value rather than lux. Choosing among the three units depends really on the intended use. If I had a camera with the p-tap connectivity, then all 3 units will as far as powering. Next decision would be if I really need the variable color and willing to fiddle with dimming function. If not, then the sola would be it if variable beam is mandatory or the Pag if it isn't. If I do not have the t-tap option, then I will have to purchase a dedicated battery ( 14/4V brick or Sony BPU series with appropriate sled/plate) or a 12 volt pack. The blender is the most versatile as far as powering and coloring goes, the sola is the brightest as far as daylight fill and the pag is the quick change (tungsten bulb/led) artist which will allow high CRI warm temperature rendition with the halogen filament. All three have their merits. The blender as well as all multi emitter led units cast multiple shadows at close range but the shadows are muted/diffused/less visible as the subject to background distance increases. To many, that is not a big issue. The shape of the LitePanels Croma and Lowel Blender lines show how brightness increases between Tungsten and Day color temperatures so the shape of the plot goes up in the middle. Whereas the Zylight is an RGB light, it's brightness is flat across all temperatures and the Sola and LEDzilla drop down as you go from native daylight to tungsten. UPDATE: I missread the Lowel Blender photometrics. It's beam at 6' is less than 4' in diameter so it's unfair to compare it with the others which have a wider beam at that distance. Last edited by Les Wilson; April 7th, 2012 at 04:34 AM. Reason: Found error in the data.